Championship club Bolton Wanderers have agreed a £7.5m takeover by the Sport Shield consortium, headed by former striker Dean Holdsworth. It follows the High Court's decision to grant Wanderers until 7 March to settle an unpaid tax and VAT bill. Paperwork was signed on the takeover agreement, which is subject to Football League ratification, minutes before Monday's winding-up hearing in London. The court heard in January that Bolton owed £2.2m to HM Revenue & Customs. "It's the end of an ongoing saga, it's great news for the club because it's been a struggle on and off the field in recent months," Bolton boss Neil Lennon told BBC Radio 5 live Sport's Mark Chapman. "We're hoping with this news today that there will be some stability within the club and we're looking forward to a brighter future." 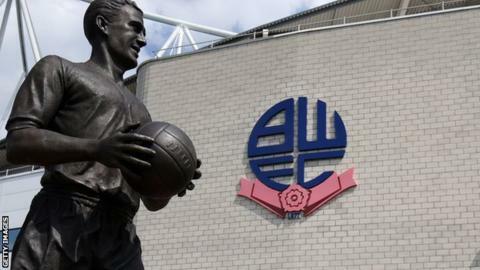 Trevor Birch, advisor to the Bolton board, said in a statement: "While this continues to be a challenging time for everyone associated with the club, we are confident that this adjournment will give us the necessary time to conclude a transfer of ownership of the club, subject to approval from the Football League." Although the initial takeover fee is £7.5m, the consortium is expected to pay a further £12.5m over the next five years, with Holdsworth becoming chairman. The one-time club record signing at £3.5m when he joined from Wimbledon in 1997, confirmed current owner Eddie Davies will remain as club president once the takeover has been ratified and completed, but will not be involved financially in the new operation. "Eddie, as part of the agreement, will remain. He's a fan and will be president of the club, there's a legacy there for Eddie and he's put a lot of money in," Holdsworth told BBC Radio 5 live. "After the takeover we won't be asking Eddie to invest into the club." Bolton are currently second-from-bottom of the Championship, six points from safety, following Saturday's 1-1 home draw with Queens Park Rangers. There has been speculation about manager Neil Lennon's future at the Macron Stadium, and although Holdsworth said he "liked" the Northern Irishman, he would not comment further about individual employees. Wanderers had sold off their training ground and stadium car park to raise funds following the initial adjournment, which gave them time to sell the club or assets. The club are £172.9m in debt, and also under a transfer embargo for breaking Financial Fair Play regulations. Holdsworth was reluctant to discuss the level of investment beyond next season, after the consortium provided evidence of funds up until the end of the 2016-17 campaign. "We haven't made false promises, if you make false promises then you let the fans down," he added. "How do you put a price on getting promotion to the Premier League? Or sustaining Championship status? What we've done is shown funds to show that the club won't go in to administration. "The club is alive, breathing and has a heartbeat." The first this does is give hope for the future. There's lot of work to be done, and there's a big challenge facing Dean Holdsworth and the new owners. But with a former Wanderer at the helm, as Chairman, it provides a visible well known presence a recognisable face of familiarity. He's a passionate football man, someone who the fans can relate to. He needs to be big, brave and bold, and above all else needs to provide more transparency than has been seen previously. For the past few years Bolton's long suffering supporters have been made to put up with a few patronising paragraphs of propaganda - that has to change - and I think it will. It has to. With someone like Dean at the helm I think he'll understand the fans as well as anybody, another crucial requirement if you're to run a club like Bolton successfully . The mood already appears to have been visibly lifted and I'm sure the staff will have heaved a collective sigh of relief with news of this latest development albeit subject to Football League approval . Bolton have a lot to do to retain Championship status and the players may well benefit from having a bit more stability behind the scenes. It's still possible to plot a route to safety, but there's not much margin for error, with all connected the club hoping that the news off the field can provide a response on it .